IT professionals with expertise in PHP, Java/J2EE, unified communications and Microsoft SQL server technologies should see pay for their skills increase, according to Foote Partners’ latest research into IT skills pay. The Vero Beach, Fla.-based IT research firm recently released its ranking of the IT skills and technical certifications that increased and decreased in value during the first quarter of 2009. For more on IT skills pay, see IT Skills Pay Drops Slightly in Q1 and New Research Reveals Highest-Paid IT Skills, Certifications During Recession. Click here. 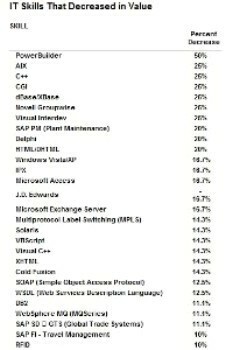 Of the skills that increased in value during the first quarter of 2009, four carried over from the fourth quarter of 2008: PHP; Java/J2EE, SE, ME; unified communications/messaging; and Microsoft SQL server. 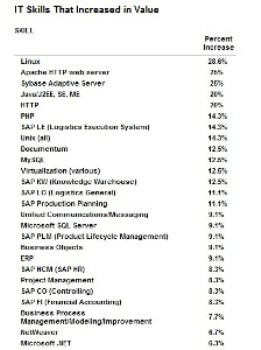 The two IT skills that declined in value during the fourth quarter of 2008 but increased in value during the first quarter of 2009 were SAP Knowledge Warehouse and NetWeaver. For more IT skills that won’t fatten your wallet, click here. Master data management, which grew in value by 10 percent during the fourth quarter, dropped by 9.1 percent during the first quarter. Just as certain IT skills shifted in value from the fourth quarter of 2008 to the first quarter of 2009, so too did specific IT certifications. For example, the Sun Certified Programmer for Java Platform, HP Certified Systems Engineer and Cisco Certified Security Professional certifications rebounded in value during the first quarter, after having experienced declines during the final months of 2008. 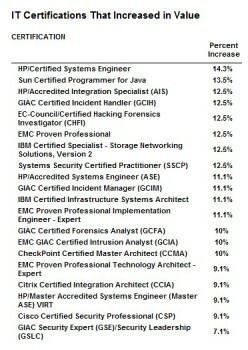 The three certifications that remained in demand from the fourth quarter of 2008 to the first quarter of this year are GIAC Certified Incident Hacker (GCIH), HP Accredited Systems Engineer and EMC Proven Professional Technology Architect – Expert. According to Foote Partners’ research, the value of IT certifications in general has been gradually declining since the fourth quarter of 2006, while the value of “non-certified” IT skills has risen steadily since the end of 2004. Only during the past two quarters has the value of non-certified IT skills experienced a slight decline-a half percent during each quarter.